The president’s call to strengthen the program is a change of heart, and a breathtaking salute to the Vermont senator. It was only a few lines in the president’s lengthy speech in Elkhart, Indiana. The New York Times and The Washington Post both missed the story. President Obama declared his commitment to sustain and defend Social Security but also to expand its benefits for retired people. That statement alone is a 100 percent reversal of where Barack Obama started on this issue seven years ago. Then he aligned his presidency with billionaire financial gurus like Pete Peterson who are pressing for so-called “entitlement reform.” That is, whacking Social Security on the grounds that the government can no longer afford it. 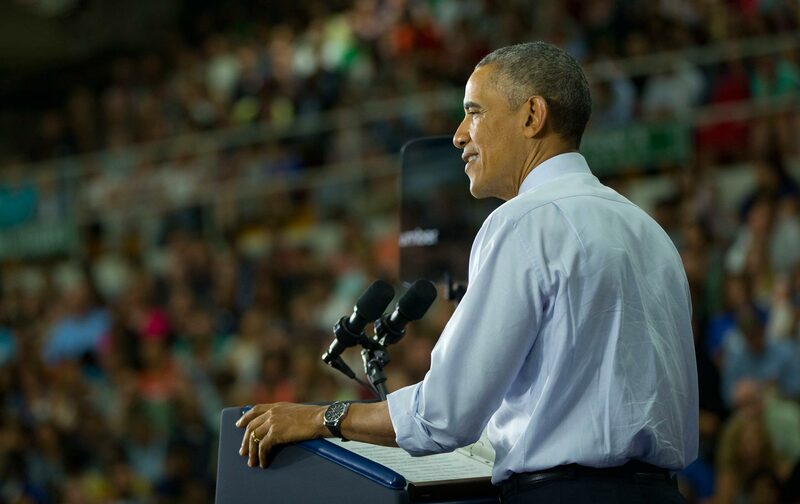 In Elkhart, Obama blithely rejected the crabby reasoning of Wall Street. The political press generally doesn’t pay much attention to boring fiscal issues like Social Security financing. Otherwise, reporters might have realized Obama was resolving a pivotal political issue that has been in contention for 30 years. The Democratic Party would no long angle for a split-the-difference compromise with fiscal conservatives, as Obama originally tried to work out early in his presidency. Bernie single-handedly forced the issue of Social Security expansion onto the national political agenda. Now the president makes clear that Democrats should stand and fight to defend and expand their New Deal legacy. It’s a taunting challenge to Republicans. If the GOP wants to make 2016 about the future of Social Security, Dems are delighted to take them on. But Obama’s change of heart also amounts to a breathtaking salute to Senator Bernie Sanders. Bernie single-handedly forced the issue of Social Security expansion onto the national political agenda. He did not ask anyone’s permission. He was belittled as a dreamy left-winger out of touch with practical reality. One of the “realists” who gently dismissed Bernie’s bold talk was Hillary Clinton. I imagine Obama’s endorsement will make it safer for HRC to embrace Bernie’s position. Several years ago, well before he decided to run for president, Sanders drafted and vetted a bill to expand the retirement benefits in a progressive manner, financed by increasing the contributions from upper incomes. The Social Security Administration (SSA) confirmed that his calculations were plausible assumptions, though of course it did not endorse the measure. Sanders didn’t hound Senate colleagues for endorsements. That would probably have been wasted energy. But he sought out grassroots activists and organizations that were already fueled with reform ideas and expertise. Social Security Works, including veteran experts from the SSA and academia, is now a broad-winged coalition. Alex Lawson, an imaginative young agitator who is executive director of Social Security Works, was not so surprised by the president’s shift; he expected it to happen at some point. But Lawson remains awestruck at the Sanders school of self-confident politics, at the Vermont senator’s single-minded guts, his strategic brilliance. The big media pundits generally dismiss Sanders. The party hacks portray him as a villain making life difficult for Hillary. Bernie pushes through.